You can’t teach an old dog new tricks – now that’s a cliché as ancient as the plot of A Star Is Born. After all, it’s a story that’s been made and remade several times in Hollywood, from the 1937 original which starred Janet Gaynor and Fredric March, to its first remake in 1957 with Judy Garland and James Mason, to then its second revamp in 1976 that had Barbara Streisand and Kris Kristofferson in the lead roles. It’s even been referenced and paid homage to in several other movies like The Artist, which had a very similar set-up in its plot, and more recently La La Land which also dealt with lovers on the fame ladder. Its story and character arcs have become the stuff of true Hollywood legend, so much so that a third remake – in development for a number of years, with directors and actors like Clint Eastwood, Will Smith and Beyoncé all coming and going from the project – was in danger of appearing stale and worn, a clichéd drama that ironically follows on from the film(s) that established those certain clichés in the first place. But it turns out that such an old dog CAN be taught new and exciting tricks – and they are all excitedly brought to the table by Bradley Cooper, who makes his directorial debut as well as co-stars alongside Lady Gaga, and who within seconds turns one of the oldest stories in Hollywood into something that feels fresh and original, unlike anything you’ve seen before that’s associated with this narrative. It’s an astounding, raw, emotional and utterly captivating piece of filmmaking, which announces Cooper as a strong storyteller that can make you feel like you’re watching this particular story for the very first time, but also isn’t afraid to go dark and heavy with some of its more upsetting scenes, resulting in an absolutely marvellous movie-going experience. This version of A Star Is Born incorporates elements from all previous editions, though the set-up and backdrop is very similar to the 1976 film; Jackson Maine (Cooper) is a country music superstar who’s a severe alcoholic, and who one night after a gig stops by at a drag bar for another drink. It’s here where he meets Ally (Gaga), an aspiring songwriter and server at the establishment who also sings and dances there to Edith Piaf’s “La Vie En Rose”, in a rendition that leaves Maine completely fascinated by her talent and beauty. They hit it off, especially after he coaxes her onto the stage during a gig to sing one of her own songs, and soon it becomes apparent that Ally’s star is very much on the rise. On the flip side, Maine slowly succumbs more and more to his extreme alcoholism, which threatens to derail his career as well as that of Ally’s, not to mention their relationship which is growing ever more complicated by her rising star in comparison to Jackson’s falling one. If you’ve seen any of the other versions of this film, then odds are you know this story very well, and even if you haven’t seen them you will probably be quick to identify the familiar plot beats this movie takes. Personally, I let that slide with this film because a) it’s one of the oldest stories in Hollywood being performed here and to alter it too much would be akin to rewriting Shakespeare, and b) it’s all executed so fantastically by director Cooper that honestly you’ll forget on numerous occasions that this tale is indeed as old as time. Even though this is his very first movie, Cooper shows great restraint and style behind the camera, lending scenes a sense of naturalism that feel very real and not just like it’s all coming from a script, and the multiple times it shows the characters onstage performing some excellently-crafted songs (many of them written or co-written by Gaga, who come next February is now all but guaranteed to walk away with at least one gold statuette) it gets up and close on them as they perform, leaving their emotions and raw swagger on full display to our never-ending wonder. It’s an extremely well-made movie, with crisp and gorgeous cinematography by Darren Aronofsky regular Matthew Libatique, as well as smooth editing that drifts the movie along at a neat and steady pace, but Cooper’s direction is undoubtedly going to be one of the most celebrated things about this film as it does everything that a true master of the craft brings to the table, except the guy did it all with his very first movie, the show-off. Not content with just delivering a masterful debut as a director, Cooper also gives what is easily one of the greatest performances of his career so far, as a guy so consumed with self-destructive tendencies and his tragic origins – he suffers from tinnitus which he’s had since birth, and his elderly father died when he was thirteen leaving him to be raised by his older half-brother (Sam Elliott, who is also fantastic in the movie) – yet he’s never really a terrible person, displaying several examples of charm and grace in the face of everything, and being a genuinely likeable guy who’s passionate about what he does and who he shares that passion with. His chemistry with Gaga is impeccable, and you will instantly fall in love with them both as they do with each other; but Gaga, even opposite more experienced acting thespians like Cooper and Elliott, is an absolute revelation that goes beyond words. Aside from being an absolutely fantastic singer, which should come as a surprise to nobody, here she really sinks her teeth into the drama and commands presence in every scene she’s in, whether it’s little moments shared with Cooper or Andrew Dice Clay who plays her father in the film, or parts where the camera’s whole focus is just on her face, filled with the kind of emotion and passion that a true movie star exhibits without even trying. The easy joke would be to say that “a star is born” when describing Gaga in this movie, but honestly that’s exactly what has happened here. 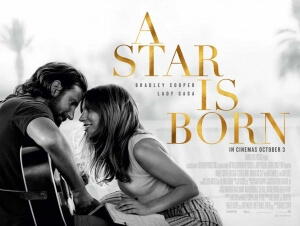 I was also not expecting this movie to totally destroy me emotionally as much as it did; there are scenes towards the end that are so brilliantly acted by both Cooper and Gaga – who again share the most dynamic chemistry with each other – which had me on the verge of tears so many times, I was fighting to keep myself together until the end credits began rolling. There are also some very upsetting moments in the film that display Maine’s rampant alcoholism, for which I commend this film greatly for not shying away from its extremely devastating consequences, including during the infamous awards ceremony scene that’s become a staple in each and every version of A Star Is Born, which this one mercifully does away with the accidental strike but instead shows something far more grim and embarrassing. Anyone going through an addition, whether it’s alcohol or drugs or anything else, is bound to have some kind of strong emotional reaction to this, as it’s an extremely accurate portrayal of someone slowly sinking into such a disease that it manages to be far more effective than so many of those after-school specials we were all treated to at a young age. This is a movie that deserves to be seen by as many people as it possibly can; it’s a fantastic piece of filmmaking, coupled with two of the year’s best performances, but it’s also proof that in an age where originality seems extinct, a fresh and indeed original voice can be heard in something that’s been around longer than most of us have been alive. Like I said: old dog, new tricks. A Star Is Born is a breathtaking piece of filmmaking by first-time director Bradley Cooper, who injects a fresh and emotional voice into one of the oldest stories in Hollywood, and delivers one of his best performances yet alongside an equally fantastic Lady Gaga with whom he shares impeccable chemistry. It is by far one of the year’s best films, and deserves to be seen by as many people as possible.